Thankfully, we’ll probably never know the answer to that question, but it’s worth mentioning given a new discovery. In a solar storm to beat all solar storms, astronomers have detected a “super”flare that’s more than 10,000 stronger than the most powerful flare on record. The events that followed happen to be the longest duration of any solar storm ever witnessed. 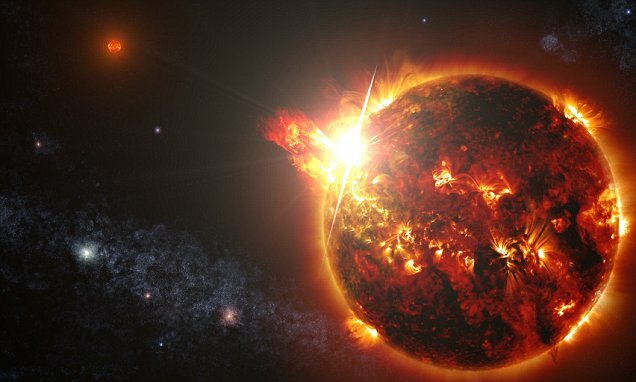 The star itself — a red dwarf (stars of this classification tend to be small, dim and rather unremarkable), called DG Canum Venaticorum (also known as DG CVn for short), that is locked in a tight orbit with another red dwarf companion — is essentially in our solar neighborhood, lurking just 60 light-years away from Earth. At approximately 5:07 p.m. EDT on April 23 of 2014, an unusually high amount of x-ray radiation was seen in the vicinity of this system by Swift’s “Burst Alert Telescope” (it also noted that its brightness at other wavelengths increased by a factor of 10 and 100 respectively), which prompted astronomers to take a closer look using various infrared and ultraviolet gathering tools and ground-based observatories. Sure enough, not long after, another equally impressive superflare was spotted (with less powerful aftershocks, perhaps even 7 of them, happening over 11 days). “For about three minutes after the BAT trigger, the superflare’s X-ray brightness was greater than the combined luminosity of both stars at all wavelengths under normal conditions,'”remarked Adam Kowalski: the scientist tasked with making sense of the data. “Flares this large from red dwarfs are exceedingly rare,” he finished. 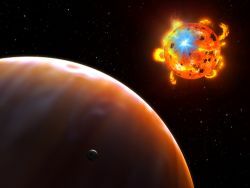 “We used to think major flaring episodes from red dwarfs lasted no more than a day, but Swift detected at least seven powerful eruptions over a period of about two weeks,” said Stephen Drake, another astrophysicist from NASA’s Goddard Space Flight Center. He spearheaded the presentation during a meeting of the American Astronomical Society’s High Energy Astrophysics Division in August. Despite the fact that DG CVn has less than a third of the Sun’s mass , it is still very energetic. Red dwarfs are known to have deeper-than-average convection zones, which help drive hot, gaseous bubbles to the solar surface. Additionally, they also have exponentially more powerful magnetic fields (bad news for orbiting planets). This, in turn, leads to an increase in the frequency and the strength of solar flares (solar activity is driven by disruptions in magnetic fields, which stem from a phenomenon called magnetic reconnection). Additionally, astronomers calculate that the star is just 30 million years 0ld (about 0.7% of our s0lar system’s age). Studying this system could give us invaluable insight into the behavior of young dwarf stars.